Police disperse locals in Mbale who were protesting the amendment of Article 102 (b) of the Constitution. PML Daily photo. MBALE– The controversial age limit motion has been included on today’s Parliament Order Paper. The contentious bill was missing but the Order Paper has been amended to cater for it. Igara West MP Raphael Magyezi is expected to table the controversial motion this afternoon, amid protests and demonstrations from opposition politicians and locals in different parts of the country. Meanwhile, hundreds of Mbale locals this morning hit the streets to demonstrate against the amendment of Article 102 (b) of the Constitution. The article puts an age limit cap on persons vying for the Presidency. Police angaged the charged mob in running battles in a mid-morning demonstration that lasted for over an hour. 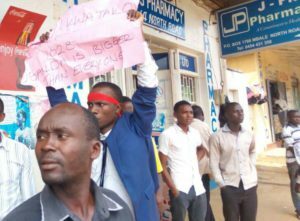 Business in Mbale town was paralysed as residents protested the intended removal of the Presidential age limit. PML Daily photo. 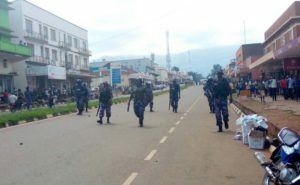 Two protestors were arrested in connection with the protests, according to the acting district police commander of Mbale, Steven Ahweera. The charged protestors managed to craftily beat the tightly vigilant police that had earlier combed through the streets of suspected demonstration-prone areas of the town. Following the arrests, angry residents police with stones, injuring one police officer in the process. Meanwhile, an unidentified resident survived being lynched by the charged mob who accused him of pick-pocketing.